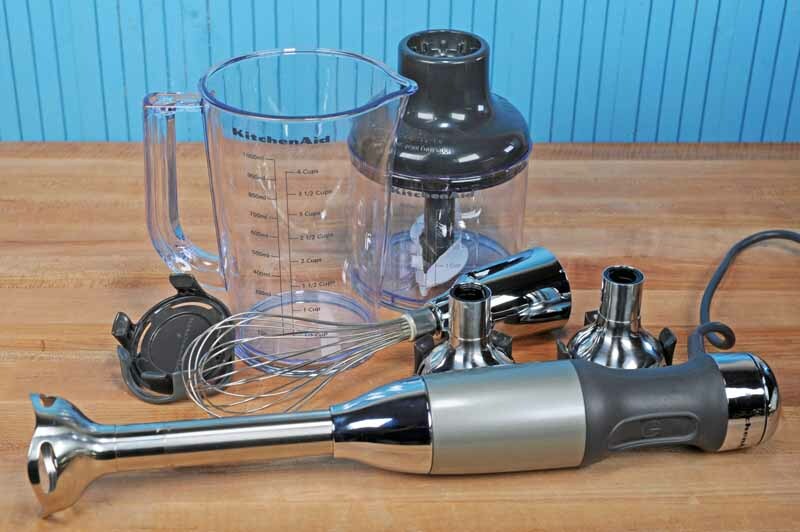 Want a hand blender that’s more than just a basic stick? 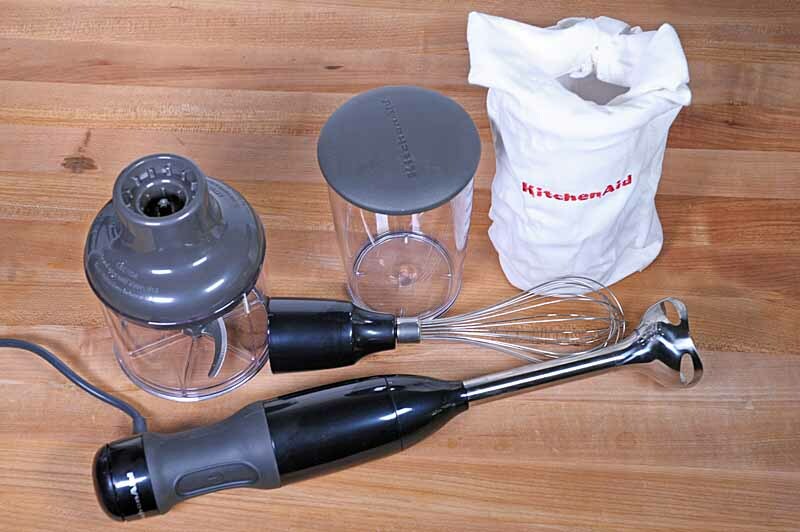 In addition to regular blends and purees, the KitchenAid KHB2561 5-speed can chop, crush, whisk, shred, and froth. It comes with a bunch of attachments, plus a case to store them in, and is very easy to use and clean. Read our full review now. European manufacturing, stylized blades for specific tasks, and plenty of power make the Bamix Gastro Pro-2 an ideal choice for the home cook. The original manufacturer of immersion blenders, Bamix of Switzerland has the history and expertise that delivers a top-end product of superb performance. Read all about it now. 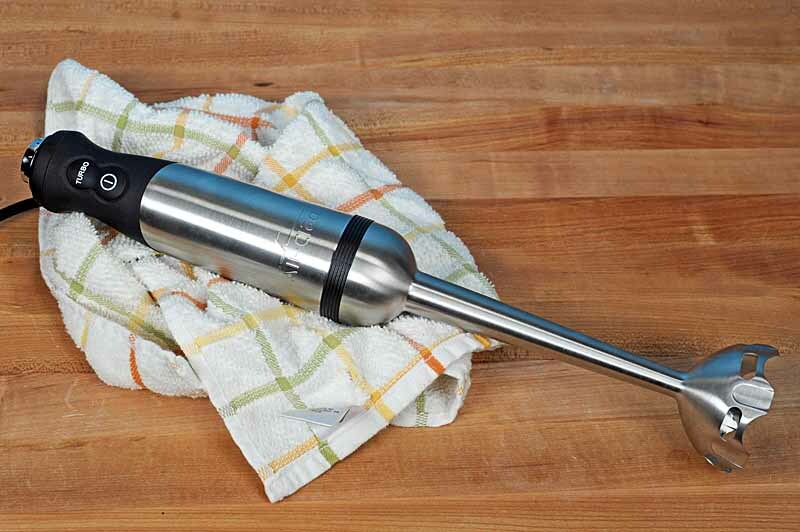 The All-Clad KZ750D Immersion Blender: Power When You Need It! For outstanding power when you need it most, the All-Clad KZ750D immersion blender delivers the goods. With a robust motor, variable speed settings, and a turbo boost, you’ll have plenty of muscle when you need it most. And of course, being an All-Clad, you know it’s built to last. Read our detailed review now! Lightweight, compact, and wonderfully versatile, the Braun MQ777 hand blender delivers the full spectrum of versatile performance. And with its outstanding accessories, you can do much more than puree – it also chops, grates, mashes, and whips. Get all the detailed information you need right here. 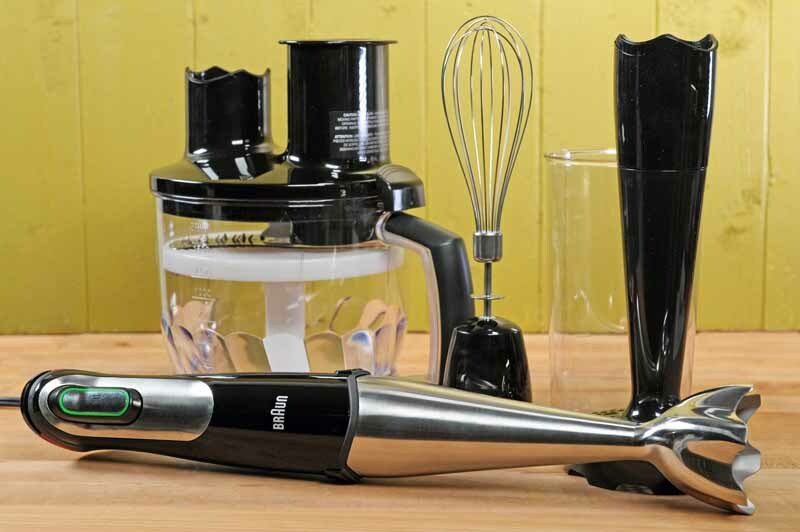 For small-batch convenience and quick, clean operation a hand blender like the Braun MA725 is a must-have kitchen tool. Small and compact, they provide plenty of power to mix or puree baby food, sauces, smoothies, soups, and more. And with an attachment or two, you can chop and whip as well. Read our review here. 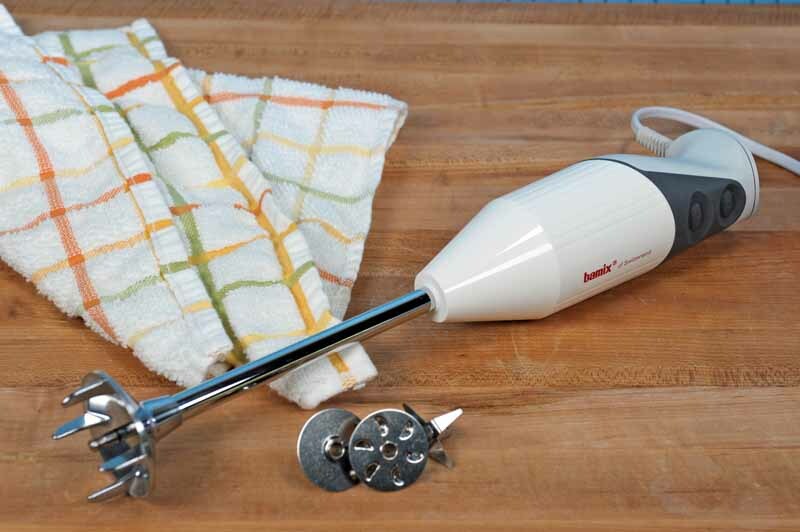 The BSB510XL is a beautiful multifunctional immersion hand blender from Breville. The robust materials’ good looks and power from the 280-watt motor make the Breville BSB510XL an attractive option. We dive into the details to see how this stacks up in real life. The KitchenAid KHB2351 is the small kitchen appliance that does a variety of jobs. 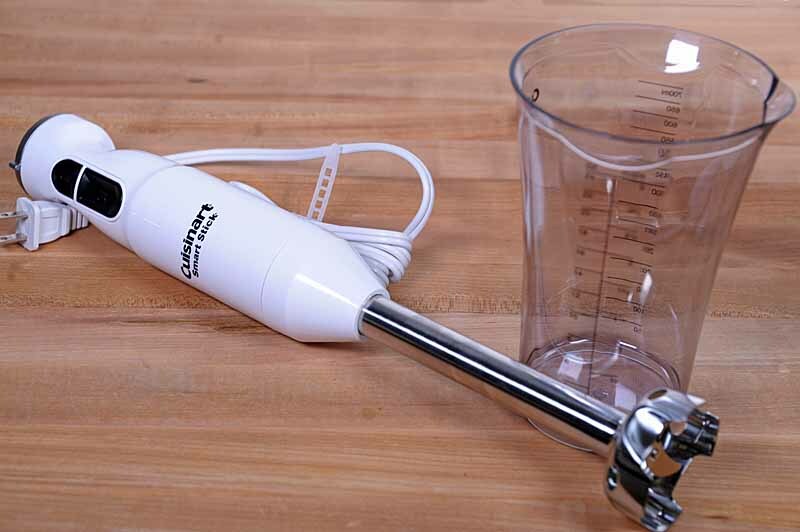 From pureeing, whisking, and chopping, this motorized hand blender offers versatile functionality to the aspiring home cook. See what new creations you can make with the KHB2351. Read more now! 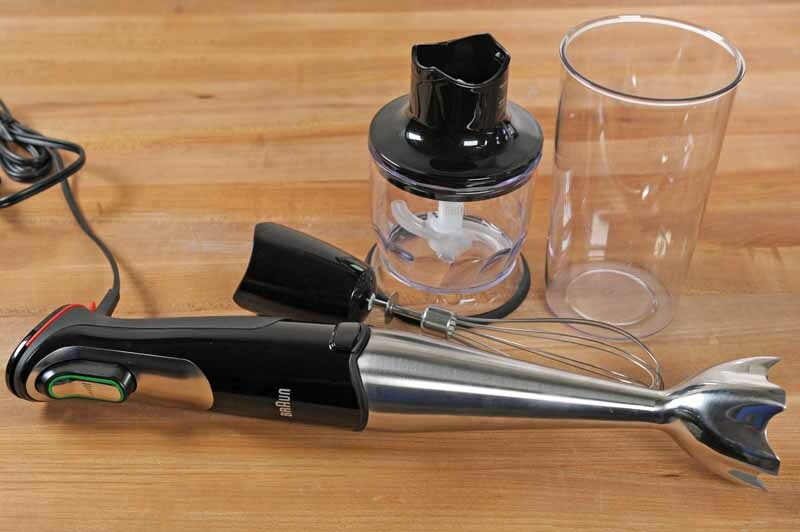 This top model Smart Stick Hand Blender goes above and beyond other immersion blenders. 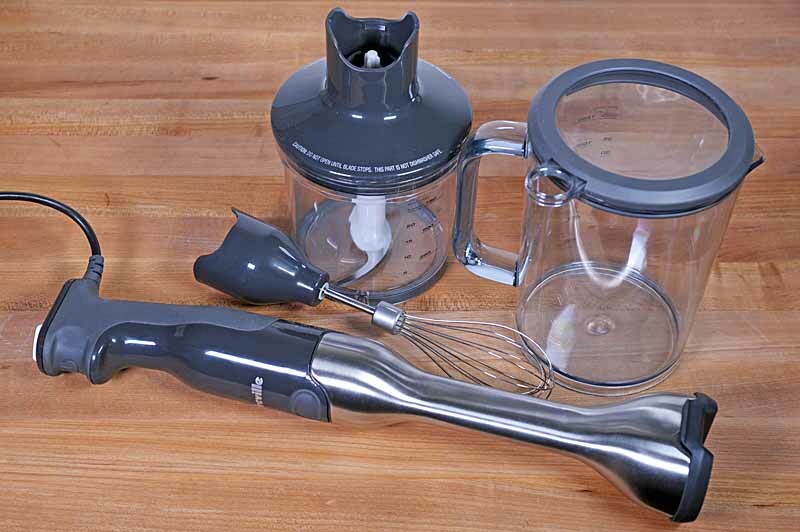 The Cuisinart CSB-79 includes an immersion wand, whisk attachment, and chopper unit that will puree, whip, and chop your ingredients with one motor. Read more now. 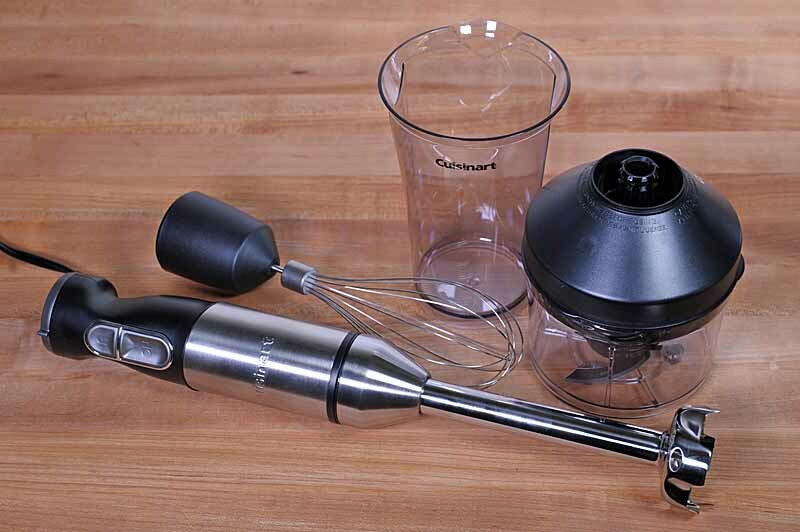 Ditch the dishes with this handy low-cost immersion blender from Cuisinart. The slim design of this Cuisinart Smart Stick makes it the perfect countertop blender or food processor replacement for smoothies, soups, and sauces. Read more now! 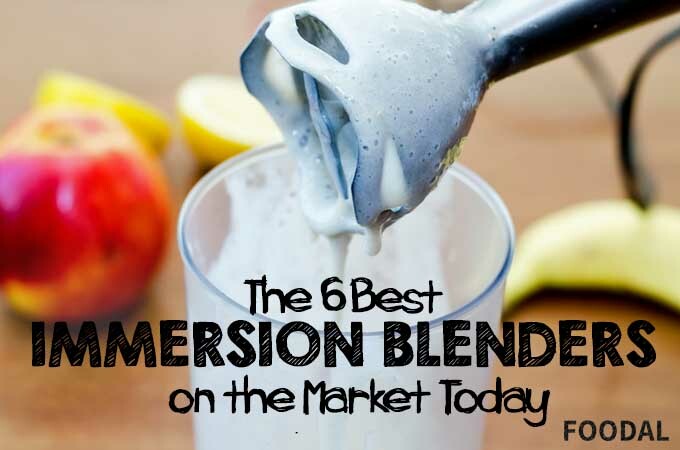 Immersion blenders are great for small jobs like pureeing soup or making baby food. The cleanup is very easy as well – just rinse the end and toss it in the dishwasher. They’re a lot smaller than the countertop models, making storing and traveling with one very easy. Read more about these great kitchen devices now.